Is it me, or is the government turning a blind eye to the obvious solution to our energy crisis? Last week members of all 50 states met in California for the first-ever Governors' Global Climate Summit/Weenie Roast (sponsored by the Rain Forest Pyromaniacs Guild and the National Smokestacks Union). At this summit/weenie roast, the governors discussed alternative methods of harvesting energy. They called for more ethanol in cars, more windmills on our nation's farms and fields, and more green beer on St. Patrick's Day. Our President-elect even addressed the conference, saying his administration plans to create millions of jobs through eco-friendly projects, and he will undo efforts by the current administration to build the world's largest chlorofluorocarbon-based air conditioner. Everyone cheered, patted themselves on the back and drove home in their Hummers without addressing another potential (and abundant) resource: baby power. During the past five months I have come to discover that a baby has the ability to kick one million times a minute. Our little Kyle can go even twice as fast when he's on a device called the "bouncy seat," which rocks back and forth with every kick. It doesn't matter what time of day it is - once he's strapped in, he's often ready to go. On an average early morning, when adults have trouble walking to the coffee pot, Kyle kicks the equivalent of a marathon. In the evening, when the adults lie down after a tiring day of sitting at a computer, Kyle is still kicking away without showing any sign of fatigue. It's so much fun trying to get him to go to bed. Unfortunately, all that energy is going to waste. 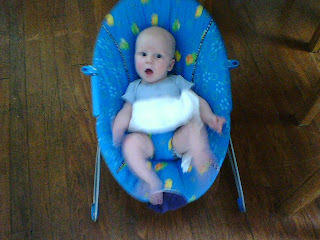 Our bouncy seat is unable to harness all that kicking power, and I doubt its manufacturer has even tried to find a way to do it. I plan to send an angry letter to the seat's maker on behalf of all environmentalists. I'm sure all we need is a simple tweak to the design and we'd be able to use it to light the apartment for months. Of course, bouncy seats are only part of the equation. Babies really don't need anything to get going, even before they learn to crawl or run. Our little guy is now flipping himself in the crib and doing more push-ups than a wise-cracking private at boot camp. Once again, an opportunity is missed. The governors at that summit/weenie roast might want to consider pushing for the development of children's clothing that will collect and store this energy in a device that parents can then plug into their homes for electricity. Sure, this piece of clothing might have a large battery pack and lots of wires, which could make snuggling a little more difficult... but isn't it worth it to not have to pay the electric company to run your toaster? Each year, some 4 million babies are born United States, and yet not a single one of them is being used to free us from foreign oil. It makes you wonder whether the government is seriously seeking renewable energy. Four million babies can probably keep most of our cities bright at night. And just imagine what would happen if we gave them sugar! The possibilities are endless. Having a baby was easy at first - at least, financially. When we first brought the little guy home, we pretty much had everything we needed for him, thanks to all the generous gifts we received. With everyone giving us clothes at the baby showers, we have enough for Kyle to make it through college without us having to buy him a single garment, as long as he remained two feet tall. The diapers did cost us some money, but we had also received a diaper cake (one of the few cakes that doesn't go well with ice cream), and we were able to live off it for a while. Even food wasn't a problem, as Jennifer provided that. But now things are changing. Kyle is starting to enjoy the world of mushy goop Gerber claims to be a food substance and is willing to charge us for it. 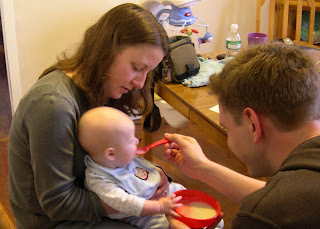 After starting off with rice cereal, we moved to applesauce, bananas and pears. We head into veggie territory next week. There was one more fruit option, called "prunes," but we decided to help Kyle become a picky eater by declaring that he wouldn't like it. I think we have to wait 'til he's at stage two before we can say that he won't like anchovies, either. This past weekend, as we waited in line to purchase the goop, a supermarket supervisor noticed Kyle and gave a big smile. At first I thought it was because we have an adorable little child, but I soon learned I was wrong. "Do you know what we call him?" he asked Jennifer. "No... what do you call him?" And no, he did not mean CD as in compact disc, though I'm sure I could create him a "Kyle Wails the Blues" album if so desired. No... the supermarket looks at our child as a Certificate of Deposit - guaranteed money for decades which will only grow as he grows older. As the supervisor left us laughing maniacally, Kyle wet another diaper and grew out of his onesie. Suddenly my wallet is feeling a whole lot lighter. After months of unemployment, I finally have a new job. Beats me how I ended up with it – I’m hardly qualified, I have very little experience, and the pay is way below what I was making before. But then, come to think of it, there wasn’t much to the interview process, and nobody even asked to see my resume. My new boss can’t read or talk coherently, in fact… and he drools an awful lot. 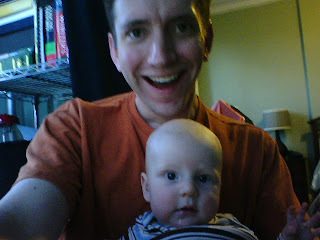 Yes, with Jennifer finally starting her new career late last month, I officially have become a stay-at-home dad. No longer am I merely sharing parenting responsibilities or finding time to do simple things, like putting on deodorant. Nope – these days from around 9am to 6pm, I am the lone adult, completely at the will of a two-foot tall person who lately has developed a habit of punching himself in the face. “Of course it will. The economy goes in cycles. If the rescue plan and proposed tax cuts work right, and if something can be done about this mortgage crisis, eventually investors and consumers will regain confidence and spend more, and that will create jobs and lead us back towards prosperity." Our discussions about global warming and the upcoming season of Lost have gone pretty much the same way. I spend each day trying to reason with someone who screams a lot, whines, and barks orders without making any sense. It's not like I haven't been through this before. After all, I did work in news. But this time around I have actual responsibility, and I have less of a clue as to what I am doing. It's a learning experience, and sometimes you have to make mistakes to get things right the next time around. For example, only a few days ago I was clipping Kyle's fingernails when I accidentally clipped off the top of one of his fingers. There was a lot of crying and blood, but in the end we realized that, hey, he still has nine other fingers and you can definitely get by with that. So it wasn't so bad. I'll just have do better next time. Here's the best part: even if I don't succeed, my boss can't fire me! That is, until he's of legal age, and by then I would have overcome my mistakes or have shipped him off to a boarding school. So right now my job is safe... and with this economy, you can't ask for anything more. On Tuesday Jennifer, Kyle and I became wrapped up in something that's been an iconic part of American life ever since our country was founded: we waited in line. It was a line so long it wrapped around a building, down a street, through an old man's backyard, up a creek, over a waterfall, and around a bend, ending just a few feet from the beginning. Sure, we had quite the wait, but it was nothing compared to what people were going through in other states. Virginia had rain. The Dakotas had snow. Kansas had that rare tsunami. At least we had beautiful weather. For us, it was like taking a pleasant stroll... with cement shoes. 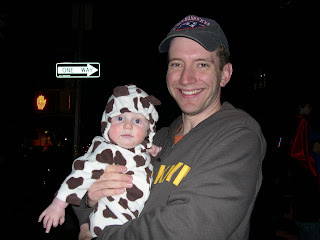 This was election day 2008, and everyone was excited. 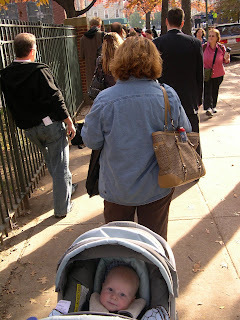 As we waited in line with the rest of America, we saw mothers and fathers wearing Obama pins and hats, and children dressed up in t-shirts that they themselves designed with brightly-colored letters that read "VOTE OBAMA!" Everyone was wearing big smiles and talking about how much this election means to them. Meanwhile, all the McCain supporters - well, this is New York, so we didn't see any McCain supporters. There were a couple people handing out pamphlets about some Green Party candidate, which were helpful in disposing our gum before we entered the building. I'm just glad that, once we arrived at the front of the line, there was a voting booth waiting for us. I hear that in some parts of the country, people waited hours only to find out that they were actually in line for the "It's A Small World" ride at Disneyland. Voting in New York is purely ceremonial, since the state was called for Obama back in August. Still, I enjoyed being out there with my family and fellow citizens, and taking part in that age-old tradition. The voting machines here remind us of just how old the tradition is, since they hearken back to the early 1800's. It's fun to flip all the switches and then pull the heavy red lever, which makes a sound similar to a falling guillotine. And if you're lucky, you might win the jackpot prize! Jennifer says the machines are, in fact, illegal, since the federal government ruled that they should be replaced with boring computer machines that do the voting for you. So, in a way, we were all accomplices to a crime by simply going to the polls. Expect the entire state of New York to get busted this weekend on a special election edition of COPS. ...Bill History, that is. Of the Defenestration Party. He ran on a platform to turn subways into roller coasters and to loosen the ban on whales as pets. He didn't get many votes. I guess America's not ready for that kind of change... yet.